Todays Workout Wednesday is the Focus T25 Alpha Cardio DVD from BeachBody. I purchased the Focus T25 kit back in December but just recently have started to make an effort to use it daily, although today was actually the first day that I made it through the entire DVD because usually I get about 10 minutes in and quit. I actually really enjoyed this workout as Shawn T (the instructor on the DVD), is really motivating and keeps the pace moving, so you don’t feel like you have been doing the same move for 5 minutes. I also came away from this ridiculously sweaty (yes!!!! ), and as I sit here and type this my thighs are still shaking 12 hours on. I fully instead to do a full review of this whole system for you guys, but I am also going to do the rest of the DVDs for my next few Workout Wednesdays, so you guys can see exactly what they are like. Quick note though I know I am terrible at some of these moves but thats mostly because they move really fast and I’m trying to keep up, but hopefully will get better with time. 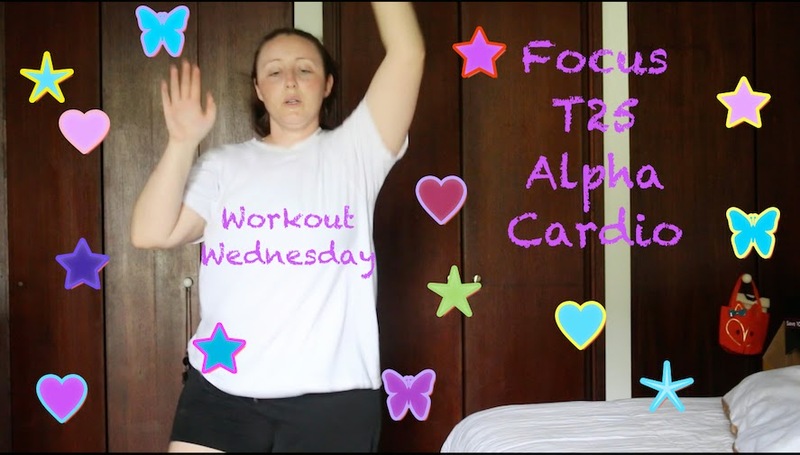 To see me do my Workout Wednesday Focus T25 Alpha Cardio watch the video below…..